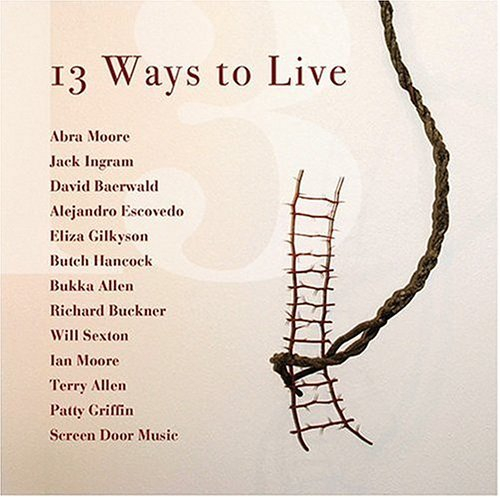 Conceived by the Austin instrumental outfit Screen Door Music on the day the Iraq war started, 13 Ways to Live features the guitar/keyboards/cello trio backing the likes of Patty Griffin, Alejandro Escovedo, Richard Buckner, Jack Ingram, Abra Moore, Will Sexton, and Terry Allen. The aim was to raise funds to help war victims, and to provide a forum for feelings about the war. It’s a compelling and musically adventurous collection, but this is not your father’s anti-war album. Unlike much Vietnam-era material, many of the tunes here make no direct reference to the battle at hand. “The man tried to cream . . . in a bloody ravine” (from David Baerwald’s “If Wishes Were Horses”) is about as explicit as most of these songs get. That proves to be good news, at least partly because the lack of specificity gives the material shelf life beyond current events. Coincidentally, perhaps, the most lyrically specific tunes also seem the most musically anachronistic. In “The Damage Done,” for example, the Flatlanders’ Butch Hancock sounds remarkably like Arlo Guthrie as he sings about sending “half a million men to save some oil in the sand.” Bukka Allen’s “Brand New Day”—which begins, “Call off the fighting now”—could be something out of John Sebastian’s solo years. Every track here impresses, though the album is as consistently melancholic as it is well done; after a few listens, you may wish for an occasional bit of upbeat relief. Granted, the somber tone is understandable, given the topic. But as Bruce Springsteen’s The Rising demonstrated, it is possible to inject some uplifting moments into an album about conflict and despair.